On behalf of the National Board of Directors, we are happy to announce the results of the Special Election for the Treasurer position that was conducted in accordance with the FAPAC Bylaws, Article V, Section 9. The results were presented by the Nomination and Election Committee Chair and Ms. Marina Milton was declared winner with the highest vote. Ms. Lily Ho, current Treasurer, will step down after her retirement from the Federal government. Ms. Marina Milton will be officially sworn in the office on April 13, 2019 to take the duties and responsibilities of the Treasurer from April 13, 2019 to September 30, 2020. The National Board of Director extends greatest appreciation to Ms. Lily Ho for her exceptional service, dedication and commitment as the Treasurer since October 1, 2017 through April 12, 2019. CONGRATULATIONS TO BOTH! To Lily, for her retirement and to Marina, as the newly elected Treasurer! FAPAC invites all employees of the Federal and DC governments, including the military, to the 2019 National Leadership Training Program (NLTP) - a reputable training opportunity for public servants. The 34th Annual NLTP will be held at the Von Braun Center in Huntsville, Alabama on May 13-16, 2019 and is a celebration of AAPI Heritage Month each May. The NLTP offers high-quality training, networking opportunities, and practical strategies for personal and professional development as it relates to the 2019 theme. During this three-day training, FAPAC recognizes high-performing individuals with a presentation of the Civilian Awards, Uniformed Services Awards, and a $5,000 Distinguished Public Service Scholarship. The NLTP will also host a free career exhibition and development programs for students and Veterans interested in public service. Visit www.fapac.org/NLTP to learn more. The holiday season has always evoked a fascinating sense of wonder for both adults and children alike. While these weeks are often encapsulated by the excitement of twinkling lights, festive food, and spirited gift-giving, my favorite part of the season is the opportunity to express gratitude for the community that we've built together in Federal Asian Pacific American Council (FAPAC). I am immensely grateful to work with a talented and passionate team to advance the mission of FAPAC to serve you - our FAPAC family members - in ensuring diverse representation of the AAPI workforce in the federal government. I've found that in order to build FAPAC to be the organization that volunteers would love be a part of and do great work for, the core values of the general membership must align with those of the National Board of Directors and those of the organization as a whole. Our core values are vital to breeding authenticity and to truly defining who we are and what FAPAC can grow to become. The greatest gift we have is each other, and this holiday season, I hope we all can cherish and appreciate the friendships and kindness that we've shown each other this past year, as well as look forward to more connections and achievements waiting to emerge in the new year. For those impacted by the current government shutdown, please feel free to reach out and let us know how we can assist during these uncertain times. We have a dedicated team of volunteers who work hard year-round to serve our members, and I am confident the FAPAC community will provide the foundation to overcome any obstacle and succeed together as one. The significance of our theme rings truer now than ever - let's remember to Unite Our Mission by Engaging Each Other as we approach the new year full of optimism for the future. The online registration at fapac@fapac.org for the upcoming National Leadership Training Program to be held in Huntsville, Alabama will be opened in January. I cannot wait to see all the great work that we will do together in 2019. I hope to see as many of you as possible at our holiday party and membership appreciation dinner on January 19, please register on line at fapac@fapac.org to attend this event. Until then, I wish you happy holidays with lots of love, laughter, and joy. May you treasure the good times always, and take the opportunity to savor this magical season with your loved ones. On behalf of the National Board of Directors, I am very excited to announce the selections of all the Standing and Ad Hoc Committee Chairs in accordance with the FAPAC Bylaws, Article IV, as presented and strongly recommended by the Vice President of Operations, Ms. Fahmida Chhipa. Each year that FAPAC has been in existence has brought new accomplishments and each year new goals are set for greater achievements. This year, we have new Team Leaders and our agenda is very aggressive and ambitious, we have a lot of work ahead of us, but with everyone’s support we can be successful! CONGRATULATIONS TO THE FAPAC Committee Chairs! Thank you to our Vice President of Operations who worked diligently to make sure we have a good team to serve this year! The “FAPAC President’s Award” is the most prestigious award and is an opportunity to recognize individuals for outstanding contributions and exceptional services to the Organization and support its mission. I wanted to express my warmest and heartfelt gratitude to the Members of the National Board of Directors and the National Board of Operations who supported me during the last 2 years. I want to recognize the important contributions of our volunteers who continuously dedicate and commits to support the mission of FAPAC and make a difference in someone’s career each day. Excellence Award: Presented to members of the National Board of Directors (NBOD) who provided positive leadership and contributed to the critical success of FAPAC in the last 24 months. Outstanding Leadership Award: Presented to members of the National Board of Operations (NBOO) who have created meaningful training and networking opportunities for the FAPAC’s members; and provided positive leadership that contributed to the success of FAPAC in the last 12 months. Trailblazers Leadership Award: Presented to the FAPAC Chapter’s President who identified and implemented innovative changes that positively affected their agency and/or community. The innovative changes are transferable to other agency and/or organizations that contributed to the success of the Chapters. President Service Award: Presented to the members who assisted the NBOD and NBOO and provided support to the President as needed and “call of duty” arise that contributed to the success of FAPAC. Star Performance Award: Presented to the members who promoted diversity, Innovation, Outstanding New Program & Project, and Innovative use of Technology. Unsung Hero Award: Recognition of the FAPAC supporters who have positively influenced the organization from behind the scenes with positive attitude, a willingness to help in whatever capacity necessary and a commitment to excellence that contributed to the success of FAPAC. Lifetime Achievement Award: Presented to members who have demonstrated exceptionally significant long-term contributions impacting the mission of the Organization. 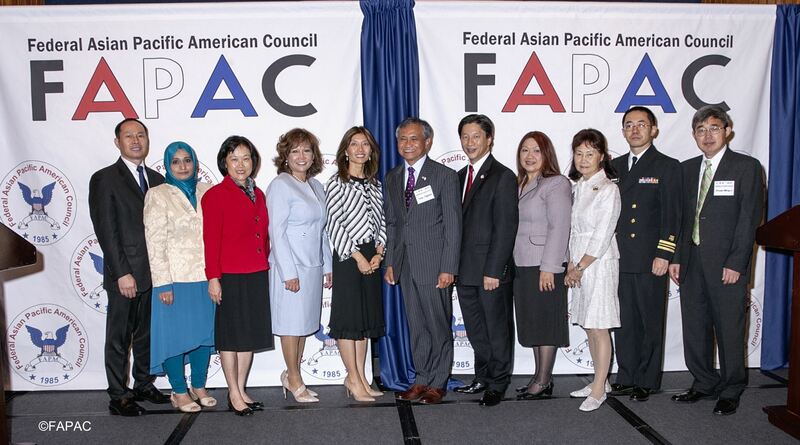 Thanks to all for your continued commitment to the FAPAC's mission; these awards were presented by the President during the Installation of the newly sworn in officials on Oct 5, 2018 at the National Press Club, Washington DC.